Welcome back to the Rupert Crew newsletter. It’s been a busy couple of months since I last updated the blog, but the highlight of the season was, of course, the Theakstons Crime Writing Festival in Harrogate. It’s always a pleasure to return to the spa town and this year was no exception. Steve Mosby orchestrated a wonderfully diverse and diverting series of panels and, although it was personally disappointing that Cathi Unsworth’s long-listed novel, WEIRDO, didn’t make it to the shortlist for Crime novel of the year, we congratulate all those who did. For any of you who missed out, you can capture some of the fabulous atmosphere at the website of event’s official photographer, Fenris Oswin. And now we are in August, the month of summer holidays and exam results. So what is new from the RCL stable? 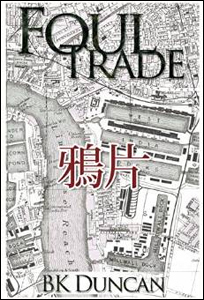 25th August marks publication day for a debut novel from B. K. Duncan, FOUL TRADE. Hailed by Andrew Taylor as an “auspicious debut, with a wonderful heroine, a twisting plot and a great sense of period”, it is the first in a series to feature May Louise Keaps, officer to the Poplar Coroner. Set in 1920, our heroine is enjoying a hundred percent success rate, never once failing to provide a jury with sufficient evidence to pronounce a verdict. However, her abilities are about to be tested to their limits by the discovery of the body of a young man in a Limehouse alleyway. The case plunges her into an underworld of opium dens, illegal gambling, drug dealers’ turf wars, the protection rackets of the notorious Bow Kum Tong, and murder. Her attempts to establish the truth draw her into deeper danger. Until the moment it becomes clear that whoever is responsible intends to avoid the hangman’s noose by arranging to have May laid out on one of her own mortuary slabs. BK Duncan will be interviewed on BBC Radio Cambridge on August 22nd. 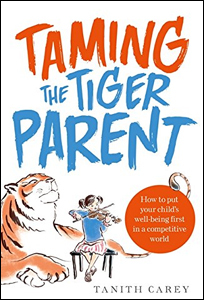 In September, the lead non-fiction title from Robinson is Tanith Carey’s TAMING THE TIGER PARENT. Mozart in the womb, Baby Einstein DVDs for newborns and iPad learning apps for toddlers. From the moment the umbilical cord is cut, today’s parents feel trapped in a never-ending race to ensure their child is the brightest and the best. But while it’s completely natural for us to want our kids to reach their potential, at what point does too much competition become damaging? In this ground breaking and provocative book, award winning journalist and parenting author Tanith Carey presents the latest research on what this contest is doing to the next generation. She explains why, far from making our children more go-getting and successful, it can backfire with lifelong repercussions, damage their emotional well-being and fracture their relationships with the very people who love them most; their parents. In this essential manual Tanith, a mother-of-two, gathers together the latest evidence to give parents practical, realistic solutions that will give them permission to take their foot off the gas and reclaim a more relaxed family life. Packed full of insights, tips and expertise, this first practical guide to how to put our children’s well-being first in a competitive world. And will be serialised in the Daily Mail in September. September is also a bumper month for Cecil Beaton fans as not only is the sumptuous PORTRAITS AND PROFILES published by Frances Lincoln (serialised in the Daily Mail) but also Rizzoli is reissuing the classic A GLASS OF FASHION. Both would make terrific gifts if you are starting your Christmas shopping early. Catherine Bruton’s latest novel, I PREDICT A RIOT has been hailed as one of the best YA books of 2014. Film rights have been optioned to FilmFirst. Echo Freer’s MIMOSA FORTUNE AND THE SMUGGLER’S CURSE has now been reissued in paperback and e-book by Acorn Books. We look forward to being in touch again in the Autumn.